Ask children where food comes from, and they’ll probably answer, “the supermarket”. Ask most adults, and their replies may not be much different. Where our foods are raised and what happens to them between farm and supermarket shelf have become mysteries. How did we become so disconnected from the sources of our breads, beef, cheeses, cereal, apples, and countless other foods that nourish us every day? If you could sum up Kitchen Literacy in three words, what would they be? I have finally found the antidote to Scott Brick whose delivery of every sentence is charged with apocalyptic urgency, whether the book deals with deadly epidemic or tulip planting techniques. In contrast, Alex Day's funereal delivery is somnolent in the extreme. Using my audible app, I have increased the speed to 1.5 and can now reach the end of sentences before having forgotten the beginnings. She also has a slight lisp... not upleasant. But for goodness sake, learn to pronounce the words properly! Nothing does more to ruin a good book than an incorrectly pronounced word. She seems to have particular trouble with words beginning in "A." With very little effort I jotted down the following mis-pronounced words: Acumen, Automaton, Apposite, Arsenical. Thank goodness she didn't have to read "archetype. I feel certain she would have pronounced the "ch" as in "cheese"and I would have run screaming from the room. 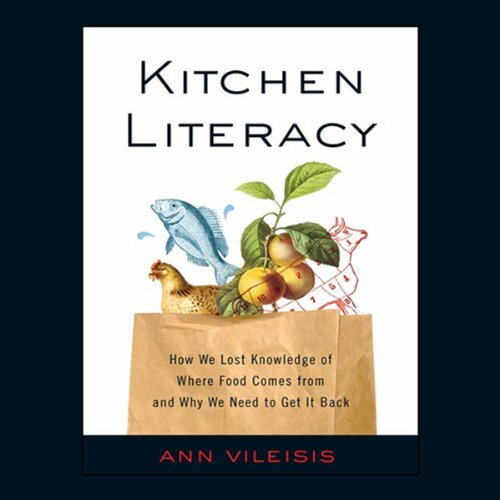 Where does Kitchen Literacy rank among all the audiobooks you’ve listened to so far? The content of the audiobook was fascinating. I really enjoyed the history of foods, food preservation, and an account of the slippery slope down to processed foods. The performance, on the other hand, was just short of dreadful. I felt like I was listening to one of my middle school students reading. I mean--really--if you are going to record a book, at least learn to pronounce words of more than a few syllables. I enjoyed this walk through American food history. It gives an excellent overview of how we have come to our current food situation. As some reviewers have already noted, it can be a little dry, but if you are already interested in the content, the history of factory farming, you will find this book enlightening. It could go deeper in areas, but is a good primer. The narrator!! Gah! She sounds like a kindergarten or ESL teacher. Sheee speeeaks sooo sloooowly, and has puts very long gaps in awkward parts of the sentences. It really does the book a disservice. The information and facts are already a little dry, so the narration could really kill this book for some. Luckily, I also have an option on my audible app to speed it up a bit. This makes it much more tolerable. It took several tries to get into this listen - the narrator is beyond dreadful! Speeding up the audio as another reviewer suggested helped a little, as was spending a day clearing brush from an acre of land - something so mindless that any audio was better than listening to the locusts and the flies buzz. I like history and I am very interested in food and nutrition, yet the minutia of this book is too much for me, I feel as if the author is trying to bury me in it. I found skimming by fast forwarding 10-20 minutes here and there to be helpful. The story improved a great deal once we got to the 20th century, perhaps it is because I can better relate to what the author is describing as far as how we think about food and nutrition, how we came to shop as we do, and our considerations about food production. I just reread the description of the book thinking I must have misread the summary the first time. Hmm, no. I just don't find the book to be as described and cannot recommend the book as is. Everyone needs to jog their memories. We currently have no understanding where our food comes from. This book really gives an appreciation for what it must have been like just to survive only a few short hundred or so years ago. Incredible journals written by true, true . Cooks! !